Relationships matter more than ever, as today’s professionals seek out ideas and insights from the people and brands they trust. As such, they devote a lot of time to reading news and keeping in touch with their networks through LinkedIn. In fact, members spend an average of 9.8 minutes per day on the social network. Through building and cultivating relationships on LinkedIn, successful connections can lead to revenue. According to LinkedIn, 50% of its members said they’re more likely to buy from a company they engage with on the platform. To ensure that your LinkedIn presence contributes to your brand’s greater business objectives, we’ve put together this guide to coach you through the process—from choosing the best premium account to getting the most out of Sprout Social’s LinkedIn management tools with the platform. LinkedIn is a valuable network for professionals everywhere, especially sales teams and recruiters. While many of its tools are available at no cost, you do have the option of upgrading to a premium account, which include access to features that can help you achieve department-specific goals. Level up your LinkedIn presence and set yourself up for success by choosing the proper premium account type. Here’s a detailed look at what each plan offers. Contact anyone on LinkedIn—from a potential client to an interested investor—with 15 InMail messages. Find connections faster with advanced search filters (groups, years of experience, function, seniority and more). See who’s viewed your profile in the last 90 days (free accounts only see the last five viewers). Perform unlimited profile searches up to your third-degree connections. This premium account comes with two different plan options: Recruiter and Recruiter Lite. The former is ideal for professional recruiters, while the latter is better for companies with occasional hiring needs or without a dedicated recruiter. 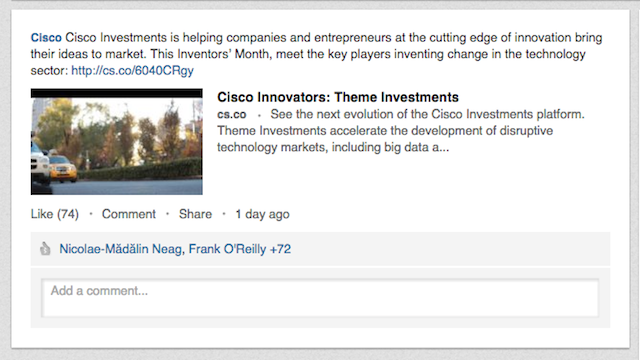 Contact anyone on LinkedIn with 30 InMail messages and work more efficiently with templates and one-to-many InMails. Perform unlimited profile searches up to your third-degree connections with seven advanced search filters. Track applicants with basic pipelining tools like projects and notes. With LinkedIn’s focus on B2B, the Sales Navigator plan offers all the features you need to build relationships that drive sales. Similar to the Recruiter plan, this premium account also comes with two different plan options: Professional and Team. Start conversations when an email address isn’t available, with 15 InMails and unlimited profile searches. Find the right people, using premium search filters, such as function and seniority, and save them to lists through Lead Builder. Get customized lead recommendations delivered right to your inbox. Stay up to date on what’s happening with the people and companies you care about with real-time insights. See everyone who’s viewed you over the last 90 days–not just the last five viewers. If you’re part of a big team, you can purchase between two and 10 seats. Need more? Contact a LinkedIn sales representative for assistance. Reach out directly to any recruiter or job poster with three InMail messages. Move to the top of recruiters’ applicant lists. See who’s viewed your profile in the last 90 days and how they found you. Use Applicant Insights to see how you compare to other applicants by seniority, education, top skills and more. Make your full LinkedIn Profile available to any LinkedIn member so that you never miss an opportunity. Once you decide which LinkedIn plan is best for your business needs, you can begin strategizing. Of course, the various departments within your organization will undoubtedly have different objectives, but here are a few best practices to keep in mind. Whether you’re a marketer driving awareness for your brand or a recruiter searching for new leads, getting your team involved on LinkedIn is one way to find success. Asking employees outside of your marketing team to interact on the network will not only increase your company’s visibility to new customers and potential hires, but it also will establish a culture where employees are actively engaged with the brand. This is as simple as having employees add the company to their LinkedIn Profiles or sharing company updates with their network. Hinge Marketing employed this practice and within six months acquired 500 new followers on its Company Page while increasing its website referral traffic by five. Just be sure that your employees are familiar with all of LinkedIn’s features as well as your brand’s key messaging before setting them loose on the platform. Better yet, give them an easy way to share curated content with a tool designed for advocacy. To break through the noise of any social network, you need to be especially relevant to your followers. Talking at an audience isn’t effective; you have to connect and build lasting relationships. Cisco found that connecting through these areas was twice as impactful as connecting through traditional business values. A simple way to develop more emotional connections is to use more personal terms with your audience. Replace words such as “professionals” and “entrepreneurs” with “you” to strike a more resonant chord. Then, you can bolster that strategy by targeting your updates to the most relevant audience segments. You can read more about this approach in our LinkedIn Targeting Guide. Each social network naturally has its own strengths and weaknesses. What works on one won’t necessarily have the same result on the others. For this reason, it’s necessary to familiarize yourself with LinkedIn’s publishing best practices. For instance, when it comes to building engagement and trust through status updates, LinkedIn recommends following the 80/20 rule: four updates for the benefit of your followers for every update promoting your company. This guarantees a well-balanced stream of rich, insightful content. It’s also worth noting that, on average, companies that post 20 times per month reach at least 60% of their unique audience. Adhering to a consistent posting schedule can lead to increased engagement from your followers. That doesn’t mean you should post without rhyme or reason. 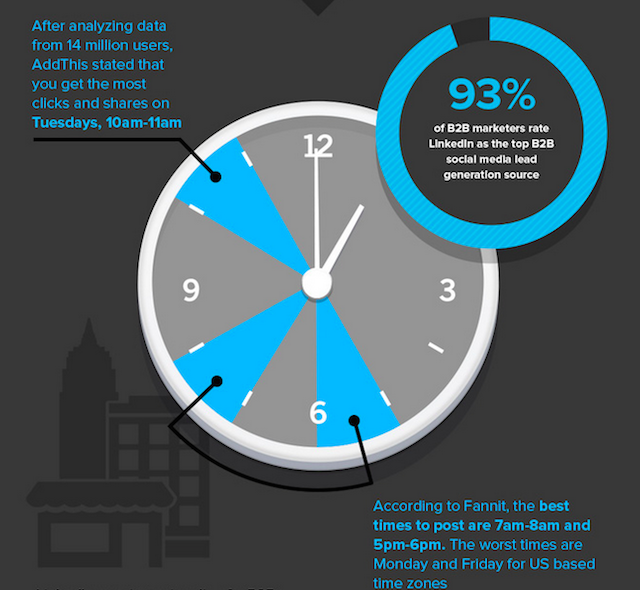 According to LinkedIn, the best time to post is weekdays during business hours. Tuesdays, Wednesdays and Thursdays appear to be more ideal than Mondays and Fridays. Posts with a link drive twice the engagement as posts without. Images on average result in a 98% higher comment rate. Links to YouTube videos that play directly in the LinkedIn feed typically result in a 75% higher share rate. Apply with LinkedIn is an API intended for use on your company’s career site or job page to help candidates easily apply for jobs. It’s especially valuable for recruiters, who can use it to round out their knowledge about a candidate’s background, recommendations, interests and connections. The Content Marketing Score is an analytical resource that offers insights into the impact of your paid and organic content on LinkedIn. It enables you to know how well you’re engaging your audience over time, and with this knowledge, you can fine-tune your strategy for more powerful results. Your score is based on member engagement with your Sponsored Updates, Company Pages, LinkedIn Groups, employee updates and, if applicable, influencer posts. It can be filtered by region, seniority, company size, job function and industry. According to Forrester Research, prospects are anywhere from two-thirds to 90% of the way through the buying journey before contacting a vendor. As such, marketing and sales people need to reach targets much earlier in the buying process. Lead Accelerator helps you do just that by using display and social advertising to attract and nurture prospects anywhere they travel online, across multiple devices. LinkedIn Influencer is a title given to hundreds of professionals who have been invited to publish on the platform. As leaders (by industry, location or seniority), they develop content that will spark conversations. Becoming a LinkedIn influencer is by invitation only. Still, even if you haven’t been invited, there’s a wealth of information to take away from others’ stories. Showcase Pages are extensions of your Company Page and highlight specific components of your business, such as a brand, product or campaign—LinkedIn members can follow whichever they’re most interested in. Then, you can create specific messaging around each Showcase Page for effective audience segmentation. To get started with Showcase Pages, click the Edit option on your Company Page and select Create a Showcase Page. You can create up to 10 Showcase Pages for your Company Page; if you require more, contact LinkedIn. In February 2014, Toshiba was the first Japanese company to set up a Showcase Page and used it to deliver tailored content to select members based on their industry, occupation and location. Within eight months, Toshiba’s Showcase Page attracted more than 160,000 followers; today, it has more than 344,000. Acquired by LinkedIn in 2012, SlideShare is the world’s largest community for sharing professional content. As a member, you can easily upload and share presentations, infographics, documents, videos, PDFs and webinars. It’s a popular content format on the platform and one that LinkedIn itself uses regularly in its blog posts and product announcements. According to a LinkedIn study, 80% of LinkedIn members say they want to connect with companies on the platform. As you know, sharing updates on your Company Page is a great way to keep your followers informed of your latest company news, branded content and job postings. All of that can be accomplished using the publishing tools in Sprout. 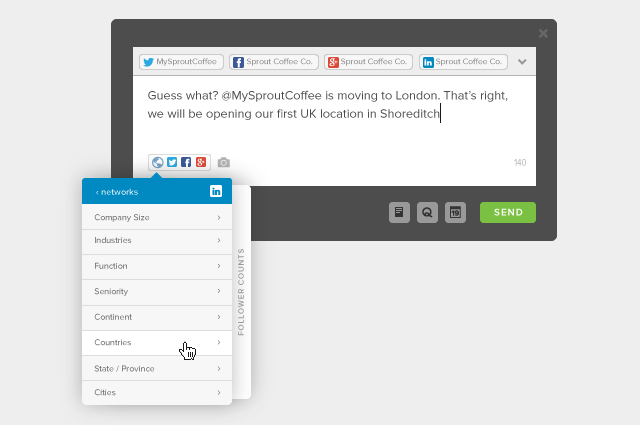 With a connected Company Page, any Sprout user who has publishing or draft-only permissions and has been granted access to the profile can begin crafting messages for LinkedIn. From there, you can target your updates by company size, industry, function, seniority and geography to ensure your messages reach the most relevant audiences.